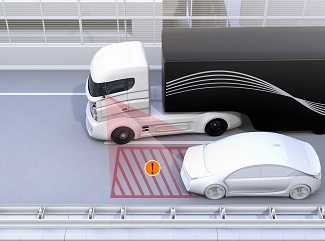 A truck’s no-zones are the large blind spots surrounding the truck where the driver cannot see other vehicles. These areas are in the front, back, and both sides of the truck. There is a larger blind spot on the truck’s right side than on its left side. If a truck accident results from a truck not seeing a car in its no-zone, the victims in the smaller vehicle can suffer catastrophic injuries. Because there are so many big rig trucks on the highways in the Dallas and Fort Worth areas, you and your family risk being injured in a truck wreck every time you go out on the road. However, there are precautions you can take to avoid being in a truck’s no-zone and to remain safe when you must pass a truck. Stay out of a truck’s no-zones whenever possible. Pass safely by being sure that you can see the trucker in his mirror before passing. Signal and accelerate so you get out of his blind spot quickly. Never pass a truck on the right where there is a larger area where the truck driver cannot see you. Do not cut in too closely when returning to the lane in front of the truck after passing it. Be certain that the truck’s cab is in your rearview mirror before changing lanes. Do not tailgate behind a truck as this could result in a deadly underride truck wreck. Keep a safe distance behind the truck and stay back farther in bad weather. Anticipate that a trucker may make a wide turn and give the truck more space. Do not try to squeeze by the truck. No matter how safely you drive around trucks, a negligent truck driver could cause a wreck. You need an experienced truck accident attorney to hold him accountable for compensating you for your injuries. To learn what steps you need to take and how we can help, contact us online or call us directly at 817.380.4888 to schedule your free, no-obligation consultation. We help injured victims throughout Texas including Arlington, North Richland, Grapevine, Bedford, Hurst, Euless, Irving and all points in between. How Long Will It Take My Truck Crash Case to Settle?